My daughter shared this delicious recipe and it is a keeper! 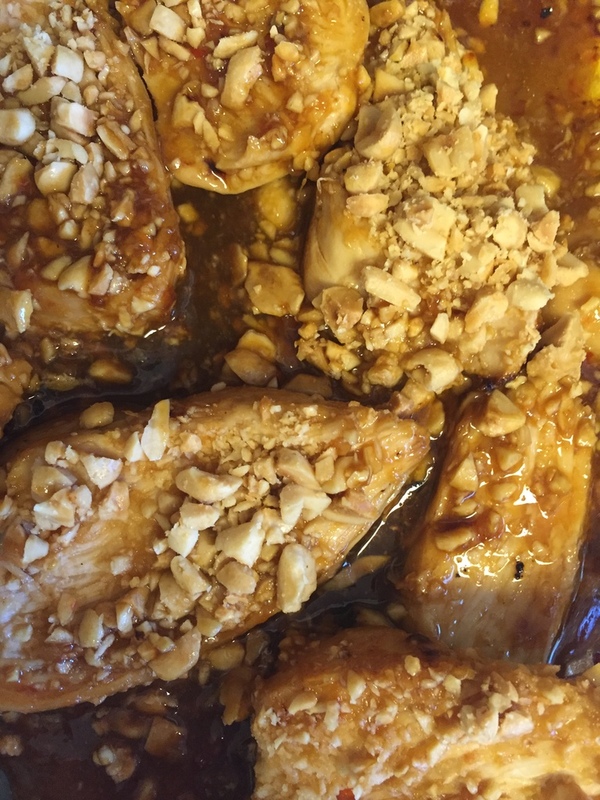 Mildly spicy-sweet chicken topped with crunchy peanuts and cilantro. Dovetailing Tip: Double this recipe. Before adding peanuts and cilantro, pull out half and save for the Meal 3, Chinese Chicken Salad. Prepare the sauce in a small bowl by combining sweet chili sauce, soy sauce, garlic, ginger and lime. Melt butter in skillet and add chicken breast pieces. Cook 2-3 minutes until browned, then turn and brown other sides. Stir chili mixture in. Lower heat, cover and simmer until chicken is done, 10-15 minutes, depending on sizes of chicken. Serve immediatley, topping with peanuts and cilantro.